Brrrrr. Except Fleming was wrong. The 6-foot giant barracuda, while horrific, is nowhere near as scary as … the 20-foot Great. White. Shark. I mean, c’mon, “sharpest row of teeth in the ocean?” Are you kidding me? You know whereof I speak. “Jaws” and its many knock-offs, YouTube’s endless array of scary animal/insect videos, and “Shark Week” have been with us for decades now. The Current Summer Shark Movie? Though not as good as “The Shallows” (last summer’s shark offering)—because nothing beats tanned, blonde, lovely Blake Lively in a faded-orange bikini—”47 Meters Down” does star the lovely Mandy Moore and Claire Holt (“The Vampire Diaries”) as Kate and Lisa, sisters vacationing in Mexico. And here you have your second key ingredient in a shark movie: There must always be lovely maidens getting chomped on by the sea monster, because they’re so vulnerable. It heightens tension. Which is why you don’t see movies about bros with backward baseball caps in a shark movie, because, who cares? So anyway, there naturally ensues the cliché of cajoling the depressed sister, Lisa (whose boyfriend just dumped her), to go out on the town for dancing, drinking, and meeting dudes. 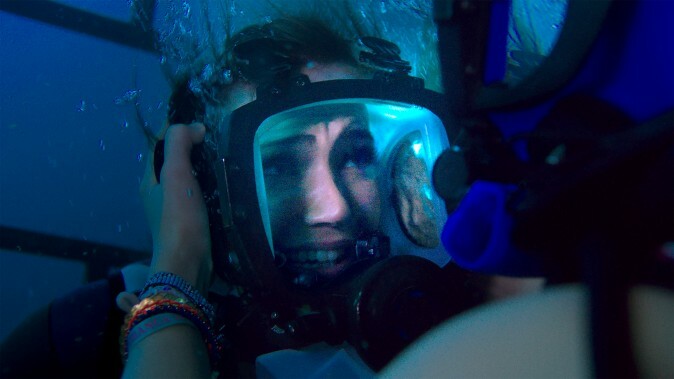 The first foolish note is that the boat’s captain, Taylor (Matthew Modine), can’t tell that while Kate is scuba-trained, her hyperventilating, freaked-out sister Lisa is only pretending to be competent. Scuba training is serious business. You can’t fake out salty boat captains. Secondly, what could go wrong with rusted-out equipment? It can break and plummet into the depths, is what. Thirdly, the neophyte diver Lisa suddenly becomes so terrified of shark chompage, she instantly becomes a scuba black-belt, and it’s never an issue again. Ahem. Awesome. So then Kate exits the cage! Into the murkiness. She’s got to swim up a certain bunch of fathoms for the radio to start intermittently crackling again, and for Taylor to tell her they’ve called for help and to get the heck back in the cage, and furthermore, to never, ever, surface that fast, because she’ll get the bends. What to do? They’re stuck between a rock and a hard place—between dwindling oxygen and mammoth Great Whites. Both sisters leave the cage at various points to swim around in the dark. This is actually pretty good, especially the part where instant-scuba-black-belt Lisa swims off the edge of a barely visible reef cliff, out over an ungodly black, fathomless pit of oceanic horror. There could be even worse things down there, like the city-bus-sized, Architeuthis squid. Very scary. All in all, it’s a prolonged situation of hyperventilating in the dive mask, screaming, whimpering, and bawling in the dive mask, with some decent jump-scares and average shark CGI. Lots of dark blue. It’s a dark blue movie. Steven Spielberg’s “Jaws” capitalized on human murky-depths terror and vilified the Great White shark into our favorite summer monster in 1975, and in so doing, probably accrued himself a massive amount of karmic debt by causing global oceanic-panic, resulting in the slaughter of a large number of these awesome creatures. 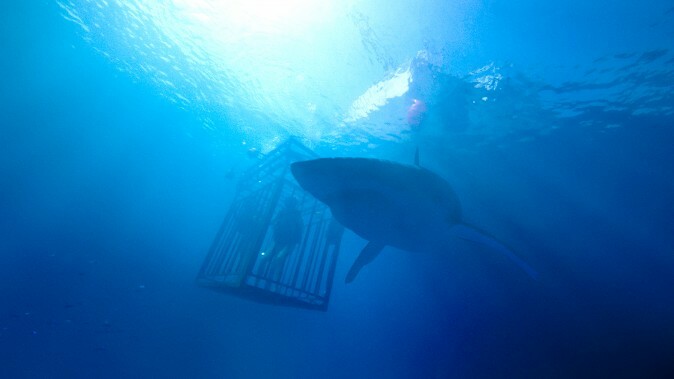 The Hollywood shark thriller is an American film genre unto itself by now, and ever since “Jaws,” it’s all been summer B-movie fare, good for 1970s drive-ins, alongside slasher and grindhouse movies. This one’s just such a guilty pleasure: not boring, but you’ll only watch it once. The Great White’s a magnificent beastie. It’s the ultimate marine predator, with the exception of the mighty orca. It’s highly intelligent and athletic; we’ve all seen that YouTube video of a Great White exploding 15 feet out of the ocean and torquing its body to chomp an airborne seal. Planet Earth! What a place. It’s simply not just the monster Spielberg’s film imprinted in our minds. It’s a tameable animal, like grizzlies and tigers. Have you seen the YouTube video of the massive female Great White that is so grateful to a fisherman who freed her from a net, that whenever he goes out in his little boat, she sticks her head out of the water to be petted like a giant, dorsal-finned, ocean-going puppy? With all the vegan and animal activism that’s cropped up lately on Facebook, we may soon find the shark monster-movie going away. But let someone make another really good shark horror film, and the Hollywood bottom line will triumph again. We do enjoy scaring ourselves, after all.